Julia Bodeeb started online writing in 2007. She also worked on staff in medical publishing for more than a decade as a reporter, managing editor and in book acquisitions. She won a Pulitzer Center Global Issues/Citizen Voices Award in 2008. Bodeeb has a Bachelor of Arts in English from Monmouth University and postgraduate credits in psychology and law. Avocado is a healthy food for women when eaten in moderation. This fruit is full of vitamins and beneficial fat that boosts your overall health. Avocado is easy to add to salads and sandwiches or to use as a spread on toast instead of butter. Talk to your doctor about the health benefits of avocados before modifying your diet. Avocados contain vitamin B6, which is an important vitamin for women. It is safest to get this vitamin via your diet, as supplements are toxic in too high a dose. Eating foods with B6 regularly is important. A lack of this vitamin often leads to developing anemia. This vitamin also keeps the brain functioning optimally, notes Portland State University Women’s Resource Center. An avocado from California has 2 milligrams of vitamin E, 9 milligrams of vitamin C and 13 milligrams of calcium, notes New York University Langone Medical Canter. The calcium in avocados help women maintain strong bones. Eating this fruit is an easy way to add a wide range of vitamins and minerals to your diet. Eating avocado also helps replenish magnesium in your body. A half-cup of California avocado has 35 milligrams of magnesium. This mineral helps women maintain a robust immune system. Magnesium also helps you keep your bones strong, notes the Office of Dietary Supplements of the National Institutes of Health. Avocados provide a strong amount of potassium to your diet. A typical California avocado has 507 milligrams of potassium. Potassium helps your muscles perform optimally, notes New York University Langone Medical Center. Thus, the healthy avocado helps women maintain the ability to participate in exercise and daily activities. Avocados contain healthy monounsaturated fats. This type of fat helps to limit inflammation in your body, notes the Harvard School of Public Health. It also works to maintain a regular rhythm for your heart and to lower your cholesterol level. Eating a salad containing avocado slices is a healthier dinner option than red meat. Eating an avocado to add fiber to your diet helps your body maintain regular bowel movements. The fiber in avocados also enables the body to effectively use sugars. 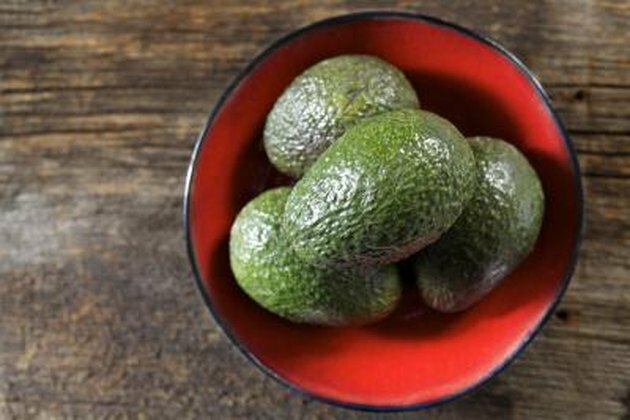 Each avocado has 7 grams of fiber, notes New York University Langone Medical Center. Harvard School of Public Health; Fats and Cholesterol: Out with the Bad, In with the Good; 2011.